We make it to the shop. On our way we see big bikes and get a few thumbs up from a couple of enthusiastic riders. The shop takes us right in and hooks maxxx’s bike up to the Ducati computer to find out what’s been going on with his electrical system and the dash. 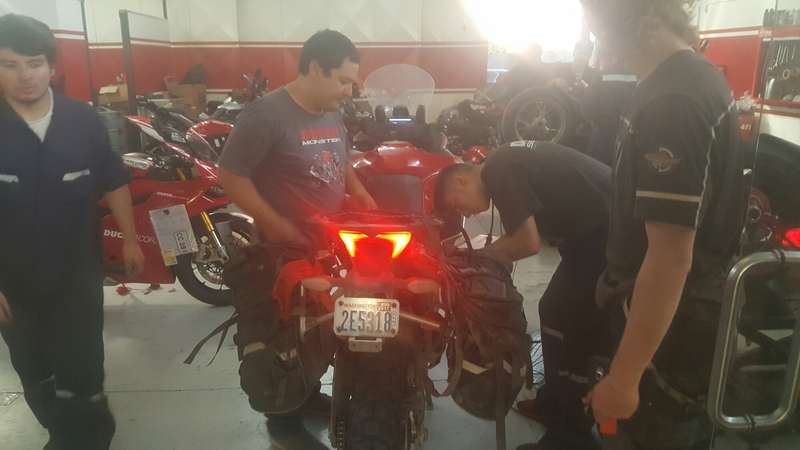 The service manager takes a couple photos and posts to their local Ducati followers and shortly we get an invite to meet up and have some dinner and conversation. The service manager drives us to the restaurant and we meet David who gets us set up with local food. A couple others show up and we stayed until about 1am. David makes sure we get to our hotel, rides in the cab with us, and it’s off to sleep. The next day maxxx and I change the oil and filter in the bikes. This dealer has a great repor with their clients, they stop in for coffee to chat. 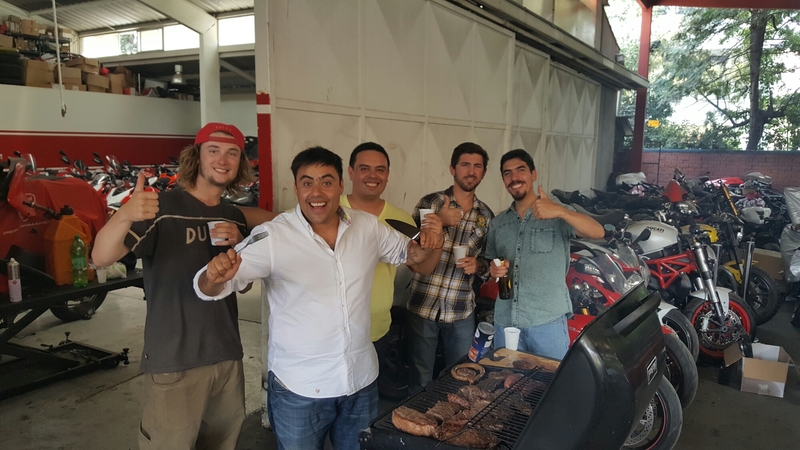 They even show up with steaks and cook it up on the grille. The club concept must be working because many own multiple ducatis. We got a late start on the day so we will stay another night in Santiago. With not much to do we hang out at the shop. A few people drop in that heard we were in town and we talk about what roads to head south on. We also talk about how the bikes have been doing. One guy was videoing me so he could show his buddies what the trip and bike were like. He was a good interviewer. One old guy was in their buying his older son a new bike. He cringed at the money aspect but we connected in that we are giving our kids a great experience. The old guy didn’t speak much English but we mixed Spanish in to communicate, he seemed to very much like what we were doing. A few more good stories like that happened that day. Maxxx and I finally left the dealer about 730pm and headed out to go see the movie hacksaw ridge and have some dinner. Wendy’s for me and taco bell was out of food so subway for maxxx. Saturday we wake up and head to the dealer to pack up and get on the road. We head out and get about two hours out into the smoky haze, wildfires, and maxxx’s bike is having some issues. 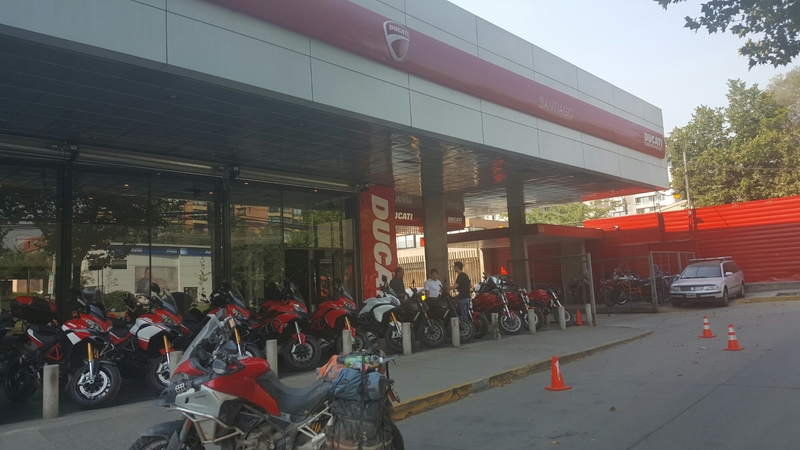 I would rather be stranded in Santiago then a small town further south, and be closer to the dealer, so it’s back to the city for us. 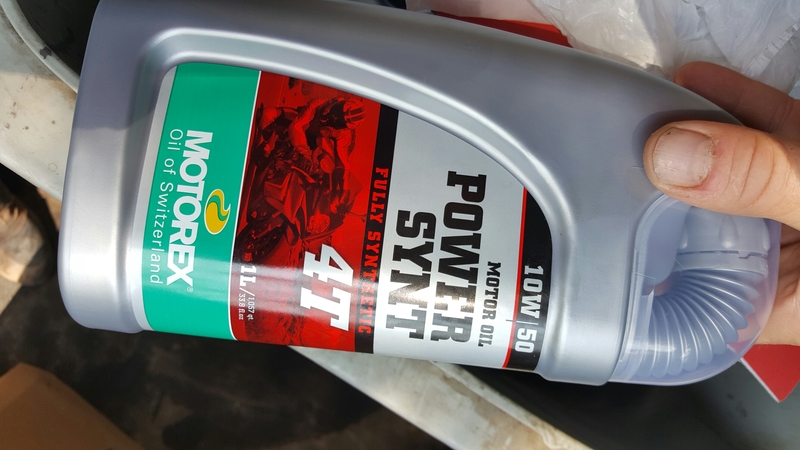 The dealer is closed now for today and also sunday so it’s Monday before the dealer can look at the bike but I will take a look at the speed sensor, clean them off and if that doesn’t help i will put mine into maxxx’s bike to see if that’s the issue. Speed sensor came up on the dealers computer initially but they don’t have replacements. Dealer thought it ok to continue on and replace later. Hi Paul — I’ve been really busy with work; just got back to see how you and Maxxx are progressing. In 1996 I visited Chile with my dad. He was in the apple business in Australia and wanted to see how the Chilean growers packed their apples. We spent 2-3 days in Santiago drove south from there, through what I called the “San Joaquin valley of Chile. I remember it being beautiful. We are headed to the valley today. They have had bad fires their and it very smoky.any place south stand out for you? Not really. I remember driving south through the beautiful valley and seeing the towering Andes to the left.